THIS IS NOT OFFICIAL, but here would be how I would set the best track. Peak of 155 knots is the strongest globally since last year's October, November and December's Vongfong, Nuri, and Hagupit also in the WPAC. Pengjiayu off the Northern Taiwan coast recorded sustained winds of 150 km/h (93 mph) and a peak gust of 211 km/h (131 mph). Taoyuan International Airport, near Taipei, reported a gust of 150 km/h (93 mph). Rainfall in the Wulai District reached 722 mm (28.4 in) in 24 hours, the second-highest on record behind Typhoon Matsa in 2004. Twelve-hour accumulations amounted to a record 632 mm (24.9 in). At the height of the storm, 4.85 million households lost electricity. This was the largest blackout on record in Taiwan due to a typhoon, surpassing the previous record of 2.79 million after Typhoon Herb in 1996. The strongest gust was 191 km/h (119 mph) in Putian while nearby Fuzhou saw gusts up to 134 km/h (83 mph).Gusts in excess of typhoon force were almost entirely confined to Fujian. Gale-force winds extended into Jiangxi and Zhejiang provinces. Much of East China saw torrential rains from the storm, with accumulations of at least 100 mm (3.9 in) reported in several provinces. Portions of Zhejiang Province saw 24 hour rainfall totals with a return period of 100–120 years. Wencheng County recorded 645 mm (25.4 in) during the same span – the heaviest in 100 years. 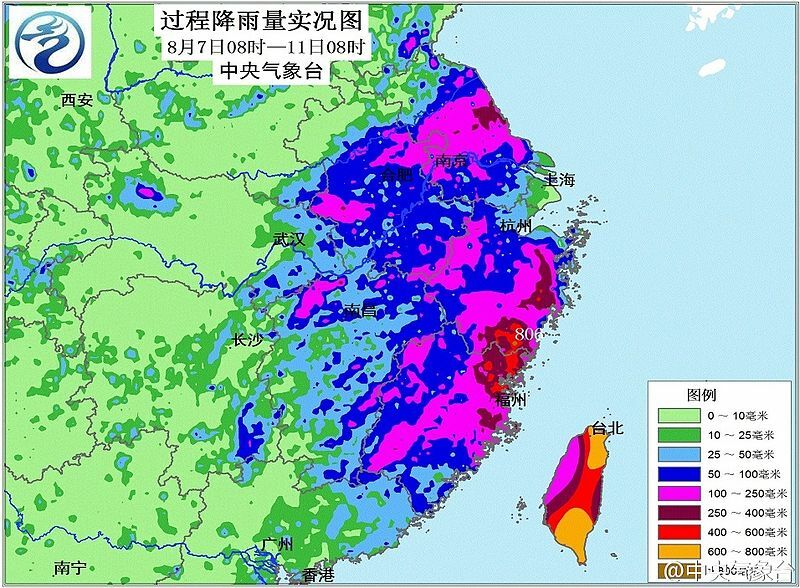 Country-wide accumulations peaked at 806 mm (31.7 in) within Wenzhou. Soudelor's merger with a cold front over Anhui and Jiangsu provinces brought torrential rains to the region from August 9–10. The heaviest rains fell in central Jiangsu Province, peaking at 467 mm (18.4 in) along the central coastline. 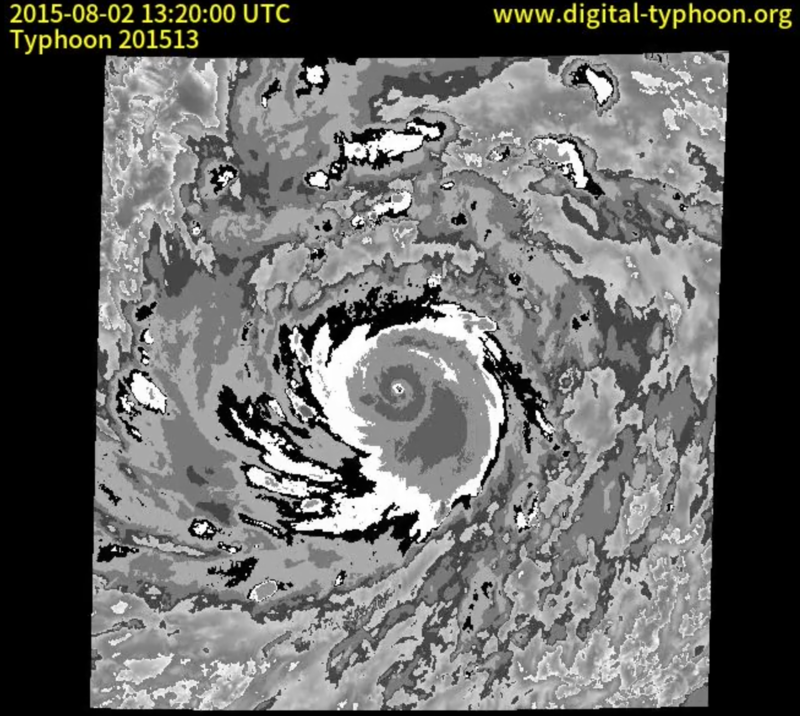 How fast were Typhoon Soudelor's winds on Saipan? 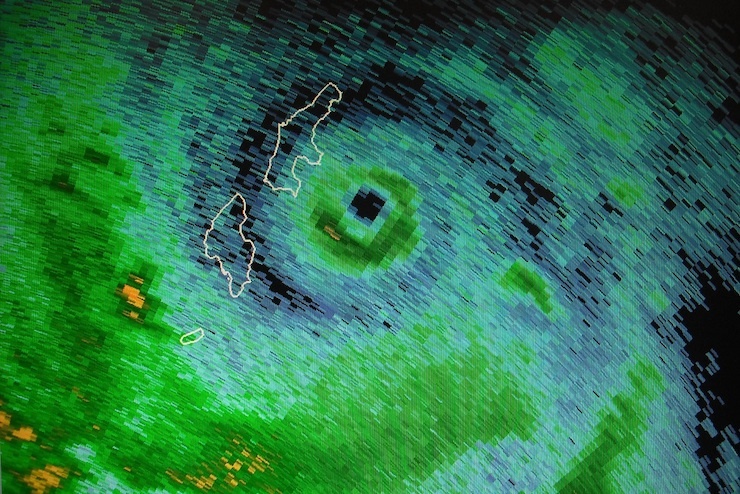 Meteorologist Dr. Mike Lander and NWS director Chip Guard recently visited Saipan and determined pinhole eye Soudelor made landfall as a strong category 3 typhoon maybe even a category 4. Upon closer examination of the finalized JTWC best track data released about a month ago, the 12Z August 2nd intensity entry (the one within an hour of Saipan landfall) remained at 90 kt, exactly the same value as the operational estimate. Furthermore, the next entry at 18Z actually dropped the 105 kt operational estimate down to 100 kt (I guess they were trying to smooth out the curve?). 1900hurricane wrote: Upon closer examination of the finalized JTWC best track data released about a month ago, the 12Z August 2nd intensity entry (the one within an hour of Saipan landfall) remained at 90 kt, exactly the same value as the operational estimate. Furthermore, the next entry at 18Z actually dropped the 105 kt operational estimate down to 100 kt (I guess they were trying to smooth out the curve?). Weird it's like JTWC is ignoring real time data all the time...A pressure of 930's measured on Saipan and damage typical of a Cat 4 was observed and confirmed by the NWS. I did some KZC analysis using the 939 mb measured at the American Memorial Park in Saipan when Soudelor made landfall there on August 2nd shortly after 12Z. Aside from the pressure, some of the input constants I used includes a latitude of 15.1ºN, forward speed of 9-10 kt, and OCI of 1005 mb (all from or derived from JTWC best track). I derived a TS wind radius from the JMA 30 kt wind data in the same method as my Typhoon Reanalysis Project and ended up with an average TS wind radius of about 113 nm. These KZC inputs gave me an expected wind velocity of about 120 kt. Additionally, I also ran KZC using the ROCI of 190-200 nm (also from JTWC best track), and also ended up with an expected wind velocity of 120 kt. Coupled with the study finding damage indicative of winds around 115 kt, I'd estimate Soudelor's Saipan landfall intensity of 115-120 kt, considerably higher than the 90 kt JTWC has in best track.